Saint Mary Catholic Cemetery, as an extension of Saint Monica Parish, exists where the people of God gather together to wait in joyful hope for the coming of our Savior and witnesses to our common belonging to the Body of Christ. 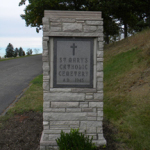 Since 1891, Saint Mary Catholic Cemetery has served the needs of the Catholic community in Upper Beaver County. Saint Mary Catholic Cemetery started with a 10 acre parcel in Chippewa in 1891 and expanded with the purchase of 17 additional acres in 1945 and recently when 3 acres off Grimm Street were cleared. Each acre has the capacity for 1,000 graves allowing Saint Mary’s to serve the parishioners of Saint Monica Parish for many years. Our Catholic cemetery is designed to be sensitive to the loved ones buried there as well as their friends and families, who rely upon our cemetery to help in the grieving process. Saint Mary Catholic Cemetery provides a safe, clean, comfortable environment to mourn and offers to those visiting a place that is characteristically Catholic, using the familiar signs and symbols of our faith to help visitors appreciate the promise of salvation. As of September 1, 2016 and subject to change. Please contact the cemetery staff for complete information. Plus funeral home and vault company expenses. Saturday interments/entombment require an additional fee. We are excited to announce our NEW Saint Monica Section of Saint Mary Cemetery conveniently located off of Clayton Road. This section offers 1,500 plots with available flat or upright granite markers and monuments. In this unique section, we will also commemorate the 8 previous parishes that comprise Saint Monica Parish.